Who Would Have Thought This Was Even Possible?! What would you say if you took a big ‘ol bite out of a luscious cupcake that was covered in fudgy, chocolate frosting only to learn that the icing was made from mashed potatoes? You wouldn’t say anything. You’d faint. Probably. But these awesome cupcakes are totally worth it. I didn’t tell my family that the frosting was made from mashed potatoes until AFTER they ate the cake. They didn’t believe me! I’ll make this mashed potato chocolate frosting again and again! Cook a medium potato in the microwave until it’s cooked through but the skin isn’t wrinkled yet, about 4 minutes. Cut the potato into pieces and, make sure it’s completely soft. If not, microwave (covered) a little longer. Mash potato with a fork. 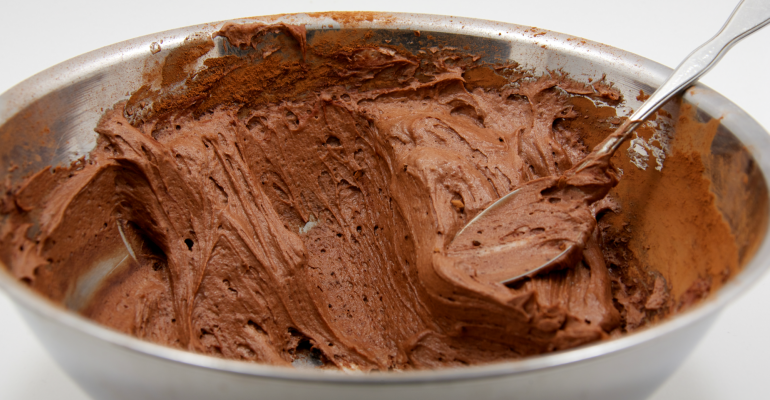 Place into a mixer bowl with the softened butter, extract and cocoa powder. Mix until smooth. Add the icing sugar one cup at a time, then 1/2 cup at a time and beat until frosting is light and smooth and of spreading consistency. Add some more icing sugar, if needed. Quick Tip: This recipe works well with both instant and homemade mashed potatoes.